The 2016 Jeep Renegade certainly isn't the first carlike Jeep, but it's the first one to prove that Jeep styling and playfulness can translate successfully to a subcompact crossover. It's rewarding to drive, yet still practical. It provides lots of character; agile handling; plenty of easy-to-use technology features; best-in-class off-road capability for Trailhawk model. For the Jeep Renegade's sophomore year, the nine-speaker premium audio option is now a Beats-branded unit. New automatic wipers are optional on the Latitude trim and standard on Limited and Trailhawk versions. The nifty removable cargo light/flashlight on the Limited and Trailhawk has been dropped. It might not be love at first sight, but a drive in the 2016 Nissan Juke will have you seeing the inner beauty of Nissan's feisty hatchback/crossover creation. With lively performance; sporty handling; unique interior/exterior color customization options; available all-wheel drive. Unfortunately, not much cargo capacity; limited rear head- and legroom; poor rear visibility; lots of hard plastic trim; relatively stiff ride is a bit disappointing in a crossover. This engine features advanced MultiAir® technology that offers outstanding power and torque with reduced emissions. It's standard on Limited and Trailhawk® models and is paired with the Class-Exclusive available nine-speed automatic transmission.x4 capability isn't needed. This powerful, fuel-efficient engine takes full advantage of our advanced MultiAir® technology. The system varies the volume of air consumed by the engine according to driving conditions resulting in maximum performance and strong pulling power from surprisingly low rpm. Standard on our Sport and Latitude models, exclusive with the six-speed manual transmission. The Jeep® Renegade offers a Class-Exclusive available nine-speed automatic transmission+. 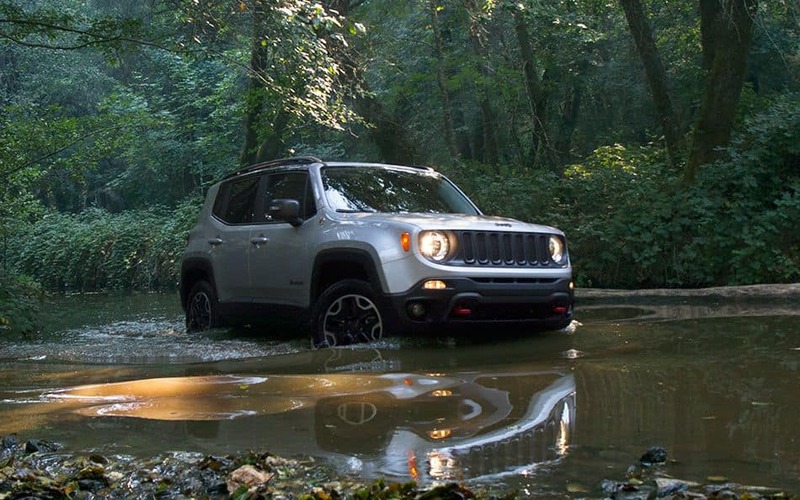 Every Renegade equipped with the available 2.4L Tigershark® engine benefits from the transmission. The wider gear selection brings outstanding launch characteristics, remarkable efficiency and virtually unnoticeable shifts between gears. The 2016 Nissan Juke features a turbocharged 1.6-liter inline four-cylinder engine that produces 188 horsepower and 177 pound-feet of torque. The Juke Nismo has the same engine, but the Nismo RS gets an upgraded version good for 215 hp and 210 lb-ft (front-wheel drive) or 211 hp and 184 lb-ft (all-wheel drive). Using electric power steering instead of hydraulic power steering cuts down on the amount of power needed from the engine. And that means more miles out of every tank. Plus, it helps automatically adjust steering feel based on vehicle speed. Nissan innovations deliver the power of a larger engine while maintaining the better fuel economy of a smaller one. Get boosted turbo performance when you want to feel the kick, or ease off and get better economy when cruising. Every trip is chance to see adventure live. Available leather-trimmed seats are soft and supple while standard cloth seats give every Renegade a distinctive look thanks to a heavy-duty mesh fabric with subtle Jeep® brand logos woven throughout. The available 7-inch full-color driver information display puts the info you want right where you need it. The Renegade features the available My Sky® open-air, dual-panel roof. You can retract the secure panel for a quick blast of sunshine with the available power My Sky roof or completely remove both roof panels for a real open-air experience. It's everything you want in a Jeep® brand vehicle. The 2016 Renegade combines iconic Jeep brand styling with outstanding capability and smart technology, all in a smaller city-friendly package. The 2016 Nissan Juke's cabin is nearly as aggressively styled as its exterior. There are a lot of organic curves and body-colored surfaces, while silver accents add cheerful ambience. Unfortunately there's no shortage of hard plastic surfaces, reminding you of the car's budget price tag. On the other hand, the Juke's controls are large and easy to operate, and the cabin features lots of thoughtful storage compartments. The 2016 Jeep® Renegade delivers a unique combination of best-in-class off-road capability, open-air freedom and convenience, a segment-first nine-speed automatic transmission that contributes to outstanding on-road and off-road driving dynamics, two fuel-efficient engines, world-class refinement, and a host of innovative safety and advanced technology offerings. Like the Jeep Cherokee, the Jeep Renegade has raised the bar - this time in the small SUV class - with the first available nine-speed automatic transmission. The Juke's steering is nicely weighted, even if it doesn't provide the best road communication, and the standard suspension skews toward the sporting side. The ride quality is passable over smooth pavement, though it can feel stiff-legged over bumps compared with more family-oriented crossovers. A decent amount of suspension travel and ground clearance allows it to handle rough roads without scraping anything. There is some noticeable wind and tire noise at highway speeds, but most buyers should find it tolerable, especially given the car's sporting bent.